Use the form below to search 1000's of listings in the local Multiple Listing Service (MLS). 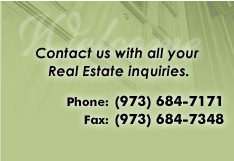 If you find a property you are interested in and would like to see or have questions about, please do not hesitate to call our office at 973-684-7171 or send an e-mail to info@leopizzirealestate.com . You may also save your searches and create your very own personal property organizer by clicking on the save search and create a property organizer link below. This feature is absolutly free and allows you to sign onto and view your saved property search anytime you'd like. Also, sign up for Free Email Listing Updates. Submit your specifications of exactly what you are looking for and those listings that meet your request will be automatically emailed to you as they become available on market.